Clocking in at 222 minutes (or seven half-hour episodes), this children’s classic has much beyond duration in common with BBC period productions. Based on the novel by F H Burnett (who lived from the mid nineteenth century to the 1920s), the plot is about a spoilt little girl Mary Lennox (Sarah Hollis Andrews) sent to the Yorkshire moors from India because of a cholera outbreak. She is confronted by a cold, old house with unfriendly servants and a colder uncle who only grudgingly concedes to see her. She does her exploring on the grounds and finds a ‘secret garden’ which used to belong to her decade-deceased auntie. She is the first to enter this over-grown, sealed-off patch by finding a key. She soon finds the hidden beauty of the place and goes about restoring some order to the ‘jungle’. She also meets the local nature-boy, Dickon (Andrew Harrison), who shows her the ‘magic’ of life as expressed through gardening. Later, Mary also finds her sickly cousin, who has been locked up in the house because he and everyone around him think his death is just a matter of time. Having two equally spoilt brats confront each other is very entertaining! The three children busy themselves in the secret garden and turn it into a thing of beauty once more. Do not expect expensive production values here. Most of the scenes are interior, except for the garden ones. The sets come across as a bit rickety and claustrophobic. Often, a background is merely painted and it shows. Still, these are minor details. It is an engrossing narrative, because it keeps you wondering ‘what happens next’. It is also very Yorkshire dialect, among the servants at least. Having the subtitles on becomes a must—at any rate, it was for me. The disc also carries quite a long interview with the four principal actors (in a garden) about their experiences during the filming and their careers afterwards. It is quite interesting. 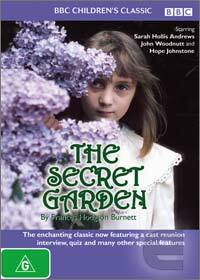 I am not so sure how easily The Secret Garden will be taken up by children today. I’m not saying that it’s showing its age, but the characters are complex, not simplistic; the environment is ‘old school’ and there is no animation of flashy effects. It does require some dedication in the viewing. I think it’s quite nice nostalgia for those who may have seen it as a child originally or for those (like me) who will generally draw up a seat to almost anything with the BBC emblem of endorsement.